More about penalties and working out who gets to the Round of 16 which of course means 16 teams playing 8 matches, before the 4 Quarter Finals, the 2 Semi-Finals, the 3rd place play-off and the Grand Final, follows. You may know about Yellow Cards and Red Cards already but if you don’t, I’ll explain here. If a FOUL such as an unsportsmanlike like move where another player is intentionally and illegally impeded (see here ) is used upon a competitor, then the Referee may issue a YELLOW CARD to the fouler. He shows the card and writes who it is allocated to in his note-book. A yellow card aims to caution a player or act as a warning that certain behaviour is not tolerated. Categories: Sport | Tags: FIFA World Cup, football, penalty shoot out, red card, soccer, soccer scoring, sports, yellow card | Permalink. We are all Winners when it comes to Perth’s unique annual summer tournament, the Hopman Cup Tennis, consisting of a Women’s Single match, a Men’s Single Match, and a Mixed Doubles, all making up one “tie” or overall match between two different countries. In my opinion, not only are the players “winners”, but so are the tournament organisers, the audience and sponsors, and anyone interested in tennis! My sister & I attended the 2015 Final on Saturday, 10th January 2015, at the Perth Arena. It started at 3.30 pm and finished around 10.00 pm. This time around we were determined to get Platinum seats, so we saved and we got tickets in Block 210, Row 1. The Platinum seating are seats at the front near the Baseline and a few blocks right at the front on the Sideline opposite the Chair Umpire, as the following image for 2015 shows. Below are the 2015 prices for the tickets. 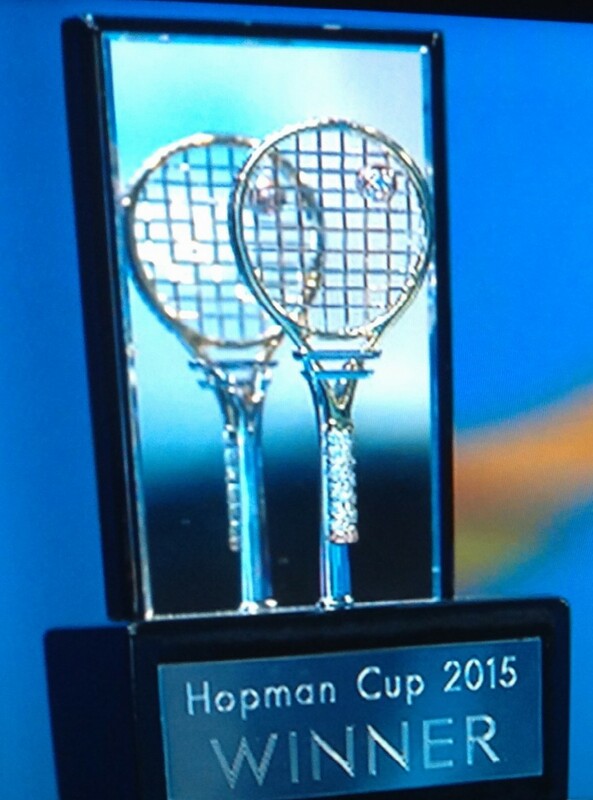 Categories: Culture, Entertainment, Recreation, Sport | Tags: hopman cup 2015, hopman cup prize money, hopman cup scoring, hopman cup tennis racquet trophies | Permalink.